Set of 5 Dumortierite tumbles. Often sold as Blue Quartz. Dumortierite can aid us in gaining control over our lives by helping us really see things for what they are – freeing us from constraining illusions which can hold us back from growing, usually through fear of change. 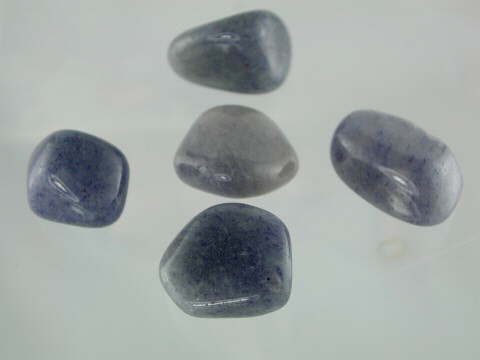 Using or wearing Dumortierite may be useful in treating addictions and compulsive or impulsive behavioural patterns and can be successful in helping open a closed Brow or Third Eye Chakra where headaches are an indication. Often sold as Blue Quartz, Dumortierite is actually a mineral in its own right but when its crystals are found in the ‘massive’ type of Quartz, colouring it blue, this is also, rather confusingly also referred to as Dumortierite. This is an excellent Throat Chakra stone. It is a hard, usually denim-blue coloured stone and is sometimes called ‘Blue Desert Lapis’. The mineral, Dumortierite, gets its name from the French paleontologist, Eugene Dumortier and was first discovered in the French Alps.